Our live Polynesian Luau and buffet will return on site Memorial Day Weekend 2019. More details to come. If you can’t wait until May check out our End of the Summer Facebook Live from the Luau event here. Our first ever Live From the Luau event was a huge success in donating meals to Three Square Food Bank, serving the greater Las Vegas region. For every share of our live Facebook video of the event we donated a meal through Three Square. We are excited to announce that 3,000 meals were donated! Enjoy a Tropical Luau Fest in Las Vegas! Feast on a delectable Tahitian buffet, sit back and enjoy live Polynesian entertainment (including audience participation) and sip on island-style specialty cocktails. It’s an unforgettable night in our very own Tahiti Village paradise. The evening includes a delectable buffet featuring island-style favorites. Savor an array of entrees and accompaniments, luscious desserts and soft drinks. Your favorite adult beverages and signature tropical cocktails are available for purchase. Forget to pack your best grass skirt or Hawaiian shirt? Don’t worry. We’ll greet you with a colorful lei that is sure to magically whisk you away to the islands. 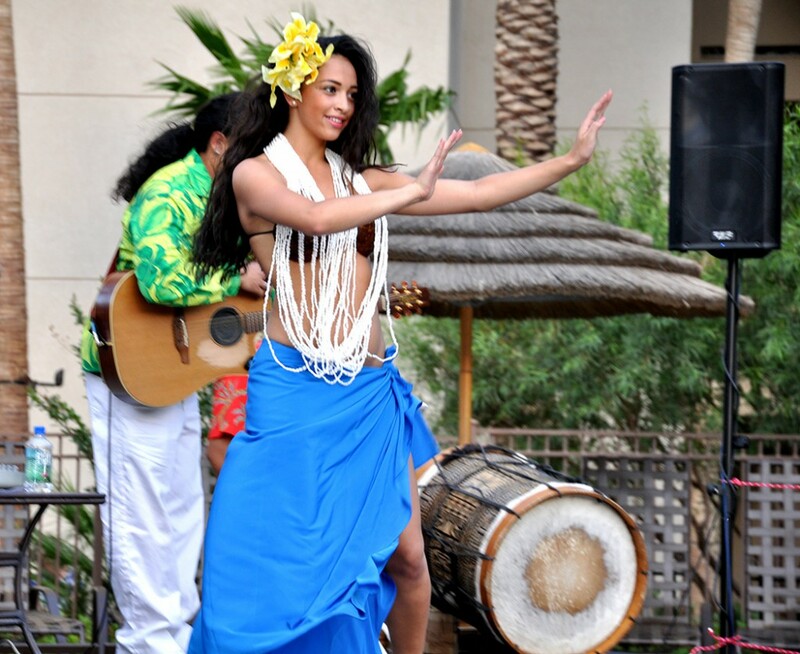 At our Summer Sunday Luau you’ll experience the colorful heritage of the Pacific Islands with Hot Lava, Las Vegas’ most popular Polynesian performers. Dressed in traditional costumes, they’ll heat up the evening with authentic Pacific Island entertainment. Hot Lava has delighted audiences worldwide with their graceful hulas, high-energy drum dances and thrilling Samoan fire twirling. Sit back and enjoy or join in the excitement of the celebration!